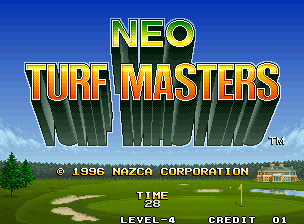 Neo Turf Masters is the second golf game to grace the Neo-Geo, with the first being Top Players Golf. While I haven't played the latter, many others have said NTM is the superior game. On to the review. Graphics-8 Not the flashiest on the Neo, but this is a golf game and it gets the job done. There is lots of nice scenery around your course (love those waterfalls. ), and the turning effect on the course when you aim your shot looks good too, almost 3D-ish. Other than that, there isn't much to speak of. Sound-9 Like it or not, prepare for these songs to be drilled into your skull. They will not come out for a long, long time. Fortunately, I found the music in NTM to be calming, which certainly fits the pace of golf. Voices are a bit funny, especially the girl that says where your shot landed (On the Greeeeeeeeeeen! ), and no matter which golfer you pick, they all use the same voice (I did it!, or, Oh No!). Gameplay-10 This is where NTM shines, the game includes six golfers with their own special qualities, four courses (all par 72) of varying difficulty, and a skins game in 2P mode. Each game in stroke play will have driving contests and a closest-to-the-pin contest, which I admit, is fun trying to break the records. Controls are simple and straightforward, aim your shot with the joystick, B & C are hook and slice, respectively. Press A once to set your power and press it again to select your trajectory and watch that sucker fly. Overall-10 NTM is a great break from all the fighters on the Neo. Like many of the other titles in the Neo's limited sports library, this game is very beer-friendly. This game also wins my girlfriend's seal of approval, and believe me, she just doesn't dole those out, especially to Neo games. Unfortunately, this game costs an arm and a leg on home cart, you could buy some new clubs for that kinda moolah. On MVS, NTM is a very reasonable $100 or so. If you are are like me, that is a gamer on a budget, I would recommend converting NTM (yes, you can use FF3 as the sac!) another alternative is the nearly-identical NGPC version (except for the omission of the Australia course, by far the easiest course in the big Neo version.) which can be found very cheap. To close, If you like golf, then you can't go wrong with this game. If you don't like golf, try it, you just might like it. If you can't find NTM anywhere, which I can definitely imagine happening (MVS units are hard to come by in the Greater Milwaukee area, at least). In that case, I recommend Golden Tee golf, found in most bars everywhere. I like both about the same.